INDONESIA: Butan darat, Butun darat, Penggung, Putat sungal. MALAY: Putat ayam, Putat ayer, Putat aying, Putat kampong. THAI: Chik ban, Chik suan. 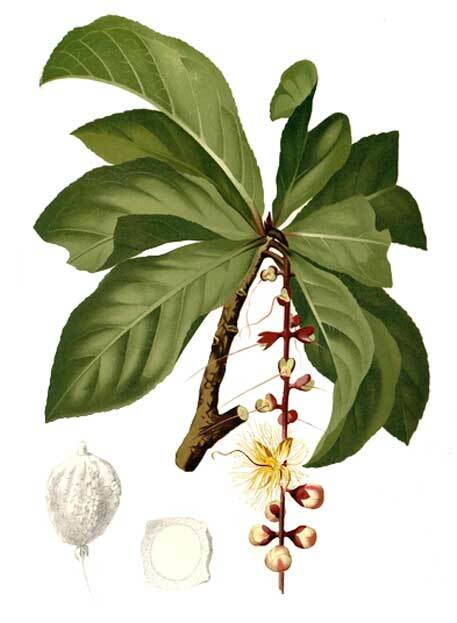 Putat is a smooth, small tree, growing to a height of 10 meters. Branches have prominent leaf-scars. Leaves occur at the ends of the branches, subsessile, oblong-ovate, 10 to 30 centimeters long, pointed at both ends, toothed at the margins. Flowers are white or pink, borne on terminal racemes or on drooping races from axils of fallen leaves, 20 to 60 centimeters long. Calyx encloses the bud, later splitting irregularly into 2 or 3 ovate, concave segments. Petals are oblong-ovate to lanceolate, 2 to 2.5 centimeters long, slightly united at the base. 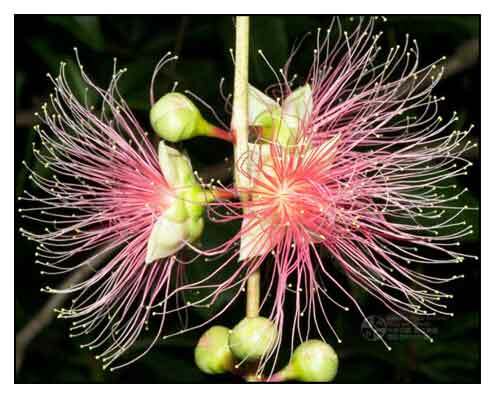 Stamens are very numerous, 3 to 4 centimeters long. Fruit is ovoid to oblong-ovoid, 5 to 6 centimeters long, somewhat 4-angled, crowned by a persistent calyx. Leathery pericarp of the fruit is green or purplish in color. - Throughout the Philippines in most or all islands and provinces, occurring In thickets and damp places along the seashore and streams at low altitudes. - Occasionally planted as a roadside ornament for its drooping inflorescences of white and pink flowers. - Also occurs in India to Malaya and Polynesia. - Study of ethyl acetate extract of stem bark isolated five compounds: 3,3'-dimethoxy ellagic acid, dihydromyticetin, gallic acid, bartogenic acid and stigmasterol. - Ethanolic extract of roots yielded two novel neo-clerodane-type diterpenoids - nasimalun A and nasimalun B. - Fruit kernels yield two sapogenins: barringtogenil and barringtogenic acid. - Roots are considered deobstruent and cooling. - Studies have show anti-tumor activity. - Decoction of bark used externally as antirheumatic. - Poultices of leaves used for skin itches, chicken pox, alone or with bark or root. - Fruit used for asthma, coughs and diarrhea. - Seeds are used in colic and ophthalmia. - Bark and leaves are used for rat and snake bits, on boils and gastric ulcers. - Pulverized fruit used as snuff for hemicrania; combined with other remedies, applied for skin affections. - Seeds, given with milk, used for colic; also used for parturition. - Powdered fruit used as snuff to clear the nostrils; also applied externally, in combination with other remedies, for throat and skin eruptions. - In Kerala, India, seeds traditionally used to treat cancer-type diseases. - Illuminant: Oil from the seed used as illuminant. 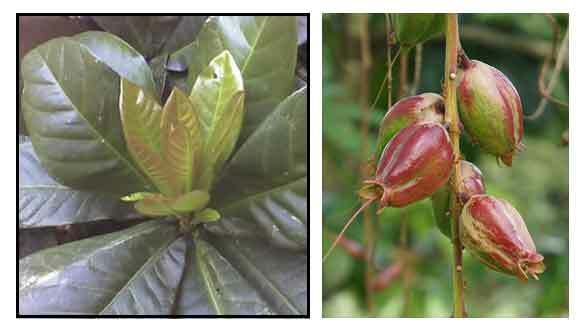 [Chemical constituents of mangrove plant Barringtonia racemosa] / Sun HY, Long LJ, We J / Zhong Yao Cai. 2006 Jul;29(7):671-2. Anti-Inflammatory and Analgesic Activity of B. racemosa Roxb. Fruits / P Shikha, PG Latha, S R Suja et al / Indian Journ of Natural Products and Resourced, Sept 2010; Vol 1, No 3: pp 356-361.